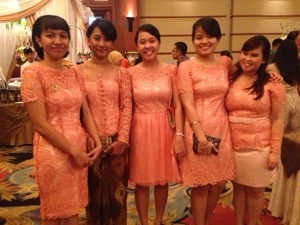 Last year, I was bridesmaid to 5 brides. This year, as far as I am aware of, I’m going to be bridesmaid to 4, and I’m going to document it in “2014’s Bridesmaid Project”.. hehehe. 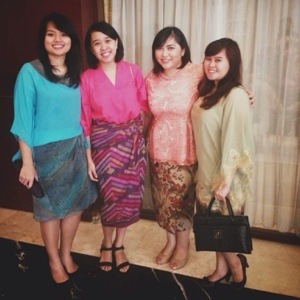 Last Sunday was Rissa and Yoni’s wedding. Rissa is one of my best friends from the office and Yoni is her high school lover. As one of the bridesmaids, I went to both the ceremony and reception. The wedding ceremony finished at around 9.30, leaving us with only 1,5 hours to get ready for the wedding reception. I was with Kenny, Adhisty and Amanda – all from the office too, we got ready together and got our hair done as well (Kudos to the hairstylist who got our hair done so quickly!). The other bridesmaids – Rissa’s friends from college and high school – were also busy getting ready in such short period of time. But afterwards we got to see Rissa and spent some time with her while she was getting ready. We had fun taking girly shots while chatting and laughing. 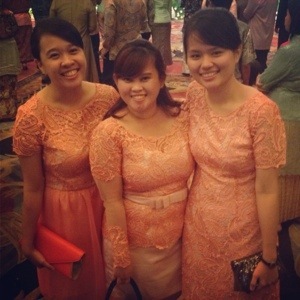 The reception was a typical Indonesian traditional wedding, grand and there were so many people! Too bad I did not spend a lot of time with Rissa and Yoni because they were busy greeting all the guests but I really enjoyed dancing to the music from the wedding singer… especially when they sang “What Makes You Beautiful” by One Direction in a jazzy way. WAIT, WHAT? Hahaha that was the first time I heard that song sang in a wedding and I can’t help but telling you, it was good and really enjoyable! :p I also enjoyed taking lots of pictures with my colleagues, chatted with my bosses who happen to be Expats and one of them actually told me stories of his wedding and how the wedding culture is in where he came from. Looking back, 2013 was.. exceptional. As cliche as it may sounds, tt was one roller coaster ride full of ups and downs. According to my old blog, I started January 2013 not so good. I also started a project ( My 365×365 instagram project, in which I was supposed to post a portrait each day with a little story of that person), and failed to finish it. The instagram account is still up and running though, maybe one day I’ll finish that project. Come February, my Mum got sick, went to the hospital and had Appendectomy. It was a tough time but we were very lucky to have support from our family and friends. March was when I went to Kuala Lumpur with Adhisty, my friend to attend Future Music Festival. We saw Bloc Party (!!! ), Temper Trap, PSY, De La Soul, Naughty by Nature, and Rita Ora. We also got to meet my old friend from the UK – Daniel, and stayed in Mba Anda (my cousin)’s apartment, overall had a great weekend break. In April I got promoted, Anggun got married to Arbow – I don’t really remember May, I guess time flies with daily routine and activities. In June I went to Bali with Kartika, Ibnu, Poppa, Dino and Thia, my friends from Bournemouth and went beach hopping, so fun! 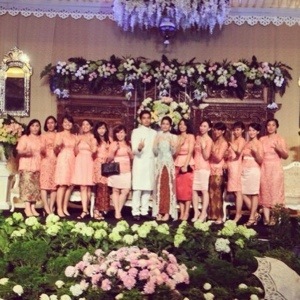 After Bali comes Dian and Pandu’s wedding, and afterwards sending them off to their new life in London. July was when opportunity knocked in and I decided to take it.. it was when I bought the ticket to the US.. with all the help that was so surreal and I couldn’t imagine before. July was also R’s birthday. A cake was delivered to his workshop, his present was previously sent, but there was a certain disappointment.. That disappointment led to doubt, which made August was a month full of doubt. October and November were filled with grad school application. I was very busy, and struggled with work and the application process. Thank God I finally submitted my applications in 1st of December.. and got to enjoy my December. It’s a funny feeling, writing a first post again. Well that because the last time I wrote a first post was back in 2005! hahaha time flies and here I am almost 9 years later,decided to give a fresh start to my blogging routine. In this blog I’ll tell you stories about my daily life, my travels, what I’m eating/listening/reading/seeing, and wearing (??) hahaha not so much a fashion blogger, so I guess there won’t be much (if not any) fashion related posts here. I’ll try to post more pictures too, and most surely will try to have a lot of fun in the process! Author ChristaPosted on January 4, 2014 Categories StoryTags 2014, first post, greeting2 Comments on Hello!